1Same scene 9 A.M. next morning. Discovered at rise of curtain. CROWLEY coming downstairs. He is in white flannel trousers, pumps, and grey tweed coat with cricket scarf round the neck. As CROWLEY comes downstairs whistling, GOLDBY enters from door up L. He has the morning papers on his arm. CROWLEY: Hallo, Goldby! Full of runs? GOLDBY: Oh, my lord, I’d rather not play to-day. My nerves are all shook, and I never was a masterpiece at it. CROWLEY: Rot! You’ll flick ’em all over the parish. Breakfast going? GOLDBY: In a minute, my lord. GOLDBY: Mr. Bedford was down before me, my lord. Mr. Raffles and Mr. Manders are on the terrace with his lordship. CROWLEY: Manders! I’ll stay where I am. GOLDBY: Thank you, my lord. BEDFORD: Oh! Good morning, Lord Crowley. CROWLEY: I hear you were an early bird- wonder what’s happened to the worm. BEDFORD: I have still to gather my worm, Lord Crowley. CROWLEY: You really think he had nothing to do with the Cracksman? BEDFORD: Crawshay? I don’t think about him at all. I know all about him, as a dangerous criminal of the old school, as different from the man I want as a blunderbuss from a Mauser. CROWLEY: But it seems such a coincidence- quite unique. BEDFORD: So I thought until I saw the perfectly priceless specimen of the antique British constable who took Crawshay into custody. Then I could understand this neighbourhood being a happy hunting-ground for all sorts and conditions of crooks. LORD AMERSTETH: Good morning, Mr. Bedford. Ah, Monty I wish you would help me to dissuade Raffles -he’s going up to town. CROWLEY: To town- to-day? He’s quite unique! Why, we’ve no one else to bowl! CROWLEY: Try myself at one end? Good idea! What train does he want to catch? GWENDOLINE (goes to LORD AMERSTETH and kisses him): Good morning everybody! Who’s catching trains? LORD AMERSTETH: I am, for one. GWENDOLINE: Not, you, Mr. Bedford? BEDFORD: Don’t know so much about trains, guess I shall be fully occupied endeavouring to catch some person unknown. GWENDOLINE: But you’ll miss that match; it’s our eleven with A.J. Raffles, against what ought to be another village club; but they’ve scoured half the country for their side, and much good it’ll do them against our A.J. BEDFORD: Exceedingly sorry -fear I shan’t see it. ETHEL: You must see Mr. Raffles. LORD AMERSTETH: I’m sorry to say it’s a question whether any of us will see Raffles in his element to-day. CROWLEY: Never mind, you’ll see me. I’m goin’ to have a bowl, girls, I’m goin’ to have a bowl! ETHEL: Heaven help us! Why? CROWLEY (rises): Never mind, old chap! Train goes 12.30.Not too much time. ETHEL: Dad, let me have my necklace out of the safe, please. Oh, Mr. Raffles, think of the runs you would have made! GWENDOLINE: And the wickets you would have taken. RAFFLES: Well, you never know. MRS. VIDAL (shakes hands with RAFFLES): I understand, Mr. Raffles, after last night, an honest game of cricket would fall rather flat. RAFFLES: The finest contrast in the world- as a matter of fact a hard day’s cricket would be the very thing. BEDFORD: Didn’t you sleep well last night? RAFFLES: Never better in my life. It would take more than the clumsy attempt of a pro. like Crawshay to keep me awake. BEDFORD: It was deuced clumsy. LORD AMERSTETH: I really wish my safe might have had a test. RAFFLES: I’m only sorry to have to go, though by the look of the sky I shall be surprised if there’s much play to-day. MRS. VIDAL: I said so. CROWLEY: Oh, but you’re all unique! 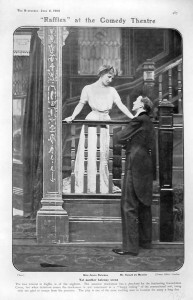 (Practising below stairs.) I’m goin’ to have a bowl. LORD AMERSTETH (taking jewel-case from safe, opens it): Bedford! BEDFORD: Nothing wrong, I hope? OMNES: The necklace! What’s wrong- etc. LORD AMERSTETH: They are gone. LORD AMERSTETH: The diamonds – the necklace – it is gone! The case is empty. BEDFORD (coolly): No, he didn’t. BEDFORD (enjoying the situation): The jewels were not in the safe last night. BEDFORD: Locked up the empty case. LORD AMERSTETH: I don’t understand. BEDFORD: Lady Melrose has had the necklace itself in her own keeping all night. I fear I am to blame, Lady Melrose consulted me. CROWLEY: Bit rough on the governor. ETHEL: He thought it was gone. GWENDOLINE: Thank Heaven it was not! BEDFORD: And the jewels could not have been taken without detection. CROWLEY: Jolly scare all round- quite unique! and I’m ready for my breakfast. 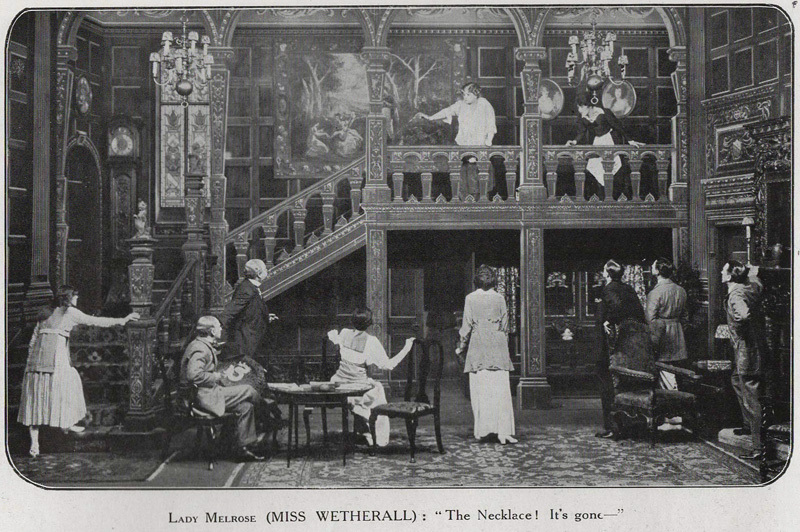 LADY MELROSE: The necklace- it is gone! ETHEL (running to foot of stairs to MARIE, pushes past MARIE, goes upstairs): Marie! GWENDOLINE: I’ll hunt for it. (Going up staircase.) It shall be found. BUNNY: Of course it’ll be found. Crawshay didn’t collar anything and nothing else happened in the night. GWENDOLINE (turning on landing): How do you know? BUNNY: I-I- I never slept a wink. LORD AMERSTETH: It must be found. GWENDOLINE: Did you win last night? BEDFORD (his face lighting up as he opens and glances at telegram): Say! One moment, Lady Melrose, there may be hope. LORD AMERSTETH: I can’t for the life of me see any cause for satisfaction in that. BEDFORD: No, Lord Amersteth, I guess you can’t, but I can. LORD AMERSTETH: Well, at any rate, we must search the house. BEDFORD: No. If you wish me to recover the missing diamonds, I must ask you to leave the field to me during the few minutes I propose to remain in your charming house. RAFFLES: He’s right, you leave it to him, he knows where they are. BEDFORD: That new car of yours, can she travel? BEDFORD: I propose to run round in that car. LORD AMERSTETH: Tell Hardy at once. BEDFORD: One moment. See that the lower part of the house is closed as at night. Let no person leave the house before I do. BEDFORD: Mr. Manders, will you kindly shut that window? It was open last night. LORD AMERSTETH: What are we to do? BEDFORD: Go in to breakfast and give me time to think. May I presume to ask Mr. Raffles to lend me his valuable assistance? RAFFLES: With the greatest pleasure. BEDFORD: May I trouble you to set that burglar alarm? RAFFLES: No trouble – only like locking the stable door behind the stolen steed. BEDFORD: The thief may still be in the house, or a confederate. RAFFLES: Ah! or a confederate; I suggest that everybody be put under arrest and searched. CROWLEY: Make it the wine cellar- and I’m there. RAFFLES: Thank you, I think not. LADY MELROSE: They cannot be found. Marie has searched everywhere. What are you going to do? LORD AMERSTETH: Leave the problem to Mr. Bedford. LORD AMERSTETH: It’s absolutely astounding! LADY MELROSE: Oh! thank you so much. RAFFLES: How are you going to keep this one? RAFFLES: No-a hundred and fifty- a hundred and fifty pounds that you don’t. RAFFLES: I can find a better use for a hundred and fifty. Done? RAFFLES: You have a clue? 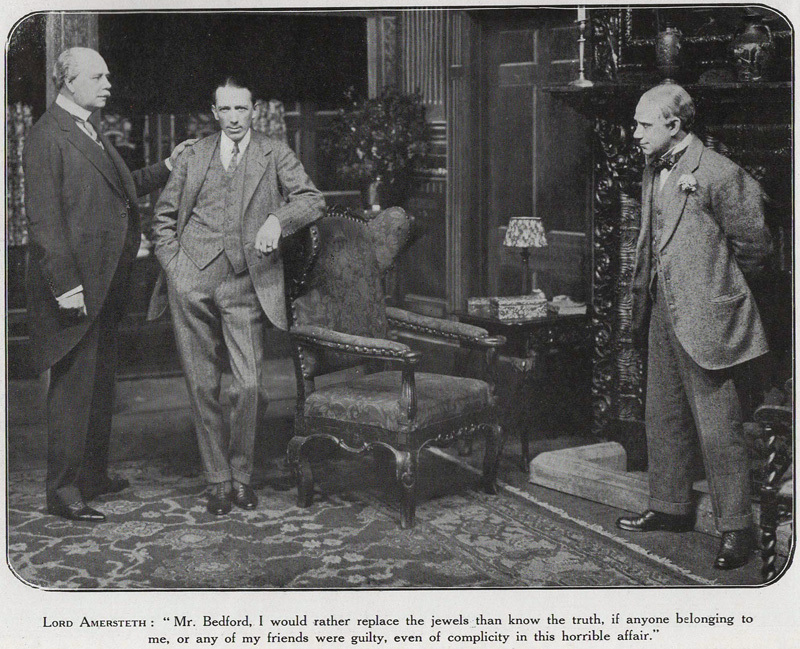 LORD AMERSTETH: Mr. Bedford, you must admit me to your confidence. BEDFORD: Lord Amersteth, frankly, I’d rather not. BEDFORD: Because, for the moment, everybody is a suspect. BEDFORD: Pardon me, in the detection of crime nothing is too ridiculous for consideration. LORD AMERSTETH: But you must have some definite theory. BEDFORD: Certainly, Crawshay had a confederate inside – another outside – perhaps. LORD AMERSTETH (pause): But the alarm; it didn’t ring- why? LORD AMERSTETH: It was very careless of Crowley. BEDFORD: Lord Crowley was outside; he left the window open. BEDFORD: Ssh! I don’t suspect anybody- or rather, to be frank, I suspect everybody. LORD AMERSTETH (drawing himself up): Even me? BEDFORD: Lord Amersteth, if you’d only go in and have your breakfast, you’d be a real help to me. LORD AMERSTETH: You will confer with me before you act? LORD AMERSTETH: I needn’t tell you, Mr. Bedford, I’d rather replace the jewels than know the truth, if any one belonging to me, or any of my friends were guilty even of complicity in this horrible affair. BEDFORD: Good! now we’ll get to work! BEDFORD: No, thanks; I never smoke when I’m at work. RAFFLES: I say, where were you when Crawshay entered last night? RAFFLES: I didn’t see you. BEDFORD: I wish you’d do me a favour. BEDFORD (places armchair like last night facing fire, looks to see by position of library door that it was as last night): Sit in this chair, face to fire. Just for the moment you are Bedford, and I – am Raffles. RAFFLES: Ambitious part for you. BEDFORD: We shall see if I’m equal to it. You – came from the library. BEDFORD: Curious that I didn’t hear you. RAFFLES: I was wearing shoes. BEDFORD: Ah yes! that’s so. RAFFLES: What are you doing now? BEDFORD: Standing in front of Lord Amersteth’ s wonderful safe. RAFFLES: I used to have one like it- not a bit of good. BEDFORD (whistles as CRAWSHAY did): You must have been here when the whistle came? RAFFLES: Which one? There were two whistles. RAFFLES: You go quickly up to that window and wait. BEDFORD: There should have been a shadow on that wall. 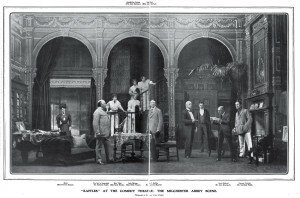 RAFFLES(at ease in chair, greatly enjoying cigarette and situation): No, I stooped low; the shadow fell on the floor. RAFFLES: Now- the burglar appears outside the window. RAFFLES: Just wide enough to admit him without moving it. RAFFLES (turns to him): Oh! let me see- where were we? 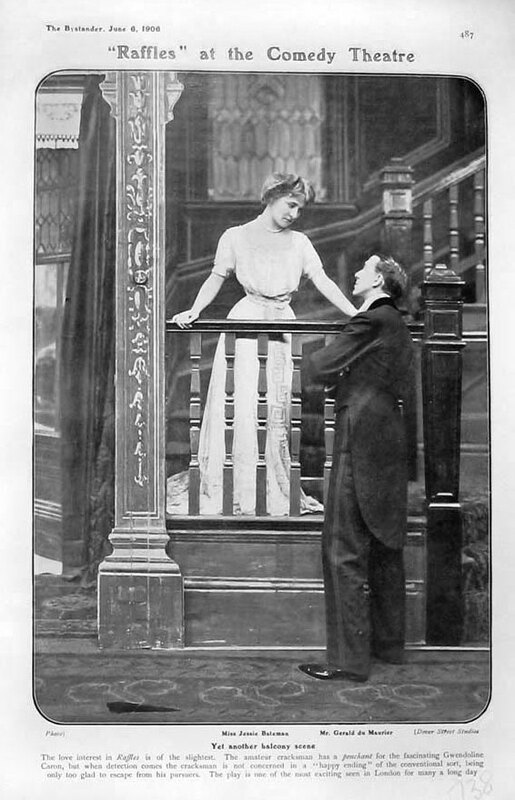 – oh yes, the burglar is just under edge of the balustrade, and then – he turns to go as he came. Now you’d better be me again. RAFFLES (rises): The rest is simple. Given the right amount of muscle for a powerful brute like Crawshay, with your knee in the small of his back you catch him by the elbows. Now you call for “lights” and- there you are. BEDFORD (rubbing his hands): Bully! BEDFORD (Pause, slight, to invent false solution): Crawshay had time to throw the jewels through the open window. RAFFLES: He had to get them first. Well? RAFFLES: Who could work it without my seeing. My dear man, you’re off the scent. RAFFLES: Really, Bedford! Crowley- why you might as well suspect – me! BEDFORD (looking at him): Someone got the jewels. GOLDBY: The motor’s at the door, sir. BEDFORD: Thanks, I shan’t be long. RAFFLES: My things gone to the station? BEDFORD (turns to him): Going on your wheel? RAFFLES: Yes. Useful old thing, the despised bicycle. RAFFLES: By the by, Bedford, my rooms are in the Albany; you might look me up and tell me what’s happened! BEDFORD: Awfully good of you. I’ll take you at your word. BEDFORD: I wonder! I … wonder. BEDFORD: Where are you going? MARIE: Nowhere- to ze Park, Monsieur. Come here. What did you do with those jewels? BEDFORD: Your ticket to London. MARIE: It is ver’ old one. BEDFORD: They mailed you that, to keep your foreign tongue still at the depot. (Takes out widow’s veil.) A widow, are you? 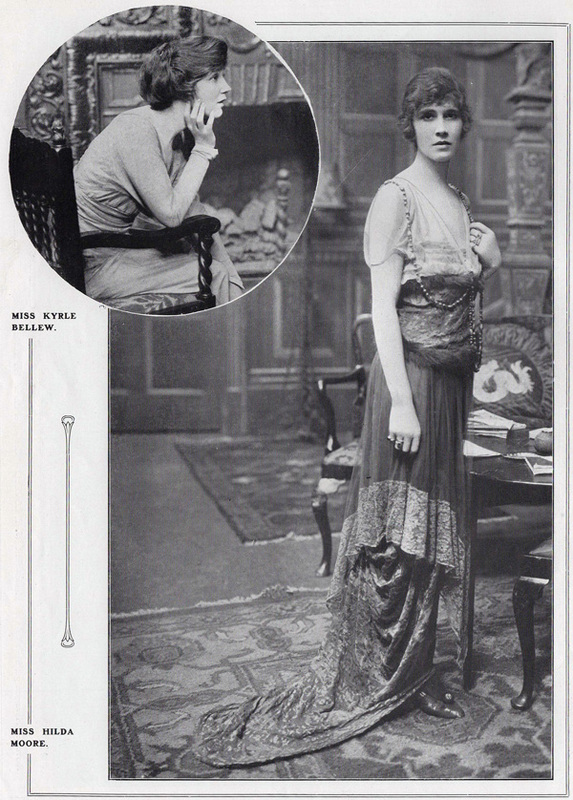 BEDFORD (puts ticket in bag, shuts it up, throws bag to her): You took that necklace from Lady Melrose last night, you stole down those stairs and dropped it into Crawshay’s hands. MARIE: Crawshay -tell one lie! BEDFORD: Crawshay never said a word. BEDFORD. Quite right, you’ll want it in gaol. BEDFORD: Oh yes, you are, even if I take the law into my own hands, and you along with me in the car. MARIE (sitting down on sofa resigned): Very well, all right. They can search, search, search; they find nothing. Bien, monsieur, it is finished, all right, very well! BEDFORD: Answer me two questions and I’ll let you go. MARIE: You will-let- me- to go? BEDFORD (nods): Did you give the necklace to Crawshay? MARIE (after pause): Oui, monsieur. BEDFORD: Had you another accomplice outside? MARIE (after a pause in which she must show cunning): Oui, monsieur. MARIE: Merci bien, monsieur, you are too good, so very good. LORD AMERSTETH: Raffles tells us you have reached no conclusion. BEDFORD (pleased, looks at him): Did Raffles say that? LORD AMERSTETH: Yes. Going over to Gray Towers? BEDFORD: No- not necessary now. LORD AMERSTETH: You might find a clue there. BEDFORD: One is enough; one clue avoids confusion. BEDFORD: A clue- so to speak. BEDFORD: My clue leads straight to the cracksman. LORD AMERSTETH: Crawshay after all. LORD AMERSTETH: Not Crawshay-who then? Speak out, man! BEDFORD: One you’d never suspect. There! I shan’t say another word now. LORD AMERSTETH (idea dawning): Good God! Bedford, you don’t suggest that? – my boy! BEDFORD: Lord Amersteth, I have promised to return the jewels in twenty-four hours from the time they were lost. I shall keep that promise. BEDFORD: Lord Amersteth, for purposes of- my own you must let me suspect- anybody – for the present. LORD AMERSTETH: Sir, I don’t wish to insult you, but if, instead of using my car to scour this neighbourhood, you would take it to the other end of England, and leave us to fight our own trouble in our own way, I can only say I should be profoundly grateful to you. And I think you must understand me in your heart. BEDFORD: Perfectly, Lord Amersteth; but I’ve gotten my clue, and I must follow it to the end- however bitter. LORD AMERSTETH: Just gone, my dear- And I’m thankful for it. LORD AMERSTETH: Because – suspicion is not a pleasant guest. GWENDOLINE: I hope he may find the jewels; but with or without them, the world will go on just the same, won’t it? LORD AMERSTETH: Not quite the same, my child, but it serves me right for inviting an outsider to meddle in our affairs. I should have pinned my faith to Raffles; he’s one of us. GWENDOLINE (pleased): You think as well as all that of Mr. Raffles? LORD AMERSTETH: Of course, don’t you? LORD AMERSTETH: I’d pin my faith to him- wouldn’t you? If you ever do, my child- if you ever do- it will be with my blessing. GOLDBY: Carriage is at the door, my lord. LORD AMERSTETH: It will all come right, Gwen; it will all come right for you. MRS. VIDAL: You are not running away, Lord Amersteth? LORD AMERSTETH (hurriedly): Only to town for the day. Good-bye. MRS. VIDAL: My dear! What do you think I have just heard? MRS. VIDAL: That- that little idiot Bedford suspects Lord Crowley of complicity in taking the necklace. MRS. VIDAL: Yes, perfectly absurd, isn’t it? When it is so obviously – somebody else. MRS. VIDAL: You know who I mean? GWENDOLINE (to MRS. VIDAL): Yes- no. I can’t believe it! MRS. VIDAL: So it does make a difference to you? MRS. VIDAL: Yet even you wouldn’t give him away? GWENDOLINE: Of course I wouldn’t. MRS. VIDAL (involuntarily): No more would I.
GWENDOLINE (mystified): Yet you hardly know him. GWENDOLINE: Mr. Raffles. You don’t suspect Mr. Raffles? MRS. VIDAL: Why, whom did you suspect? GWENDOLINE: But you weren’t always- that’s why you are now; I see -you hate him! GWENDOLINE: Perhaps Mr. Raffles returns your feeling with equal reason. MRS. VIDAL: Possibly- since I happen to know all about him. GWENDOLINE: I shall ask him to tell me about you. MRS. VIDAL: You’ll find his history much more thrilling if he’ll tell it you. It’s not the sort of human document to leave about. GWENDOLINE: Mrs. Vidal, I’m one of those who happen to think more of Mr. Raffles than of most people. I hope you don’t flatter yourself that your silly insinuations are going to change my opinion of him? MRS. VIDAL: Shall I tell you what you’re doing? MRS. VIDAL: You’re defending the man you love. GWENDOLINE: Am I! Well, I’d rather do that than abuse one who obviously didn’t care a rap for me. I suppose you think I haven’t eyes. Your motives at any rate are not too subtle for me. MRS. VIDAL (rises): You’ll be sorry you said all this! MRS. VIDAL: I’ll make you. GWENDOLINE: You can do what you like. (Sees RAFFLES) Good-bye Mr. Raffles. MRS. VIDAL: Yes, just saying good-bye to dear Gwen. No, on second thoughts, I shall not say it to you. Au revoir, Mr. Raffles. GWENDOLINE: Is it so short? RAFFLES: Short and precious- to me, I’ve got to go. RAFFLES: I doubt if they’ll play, the rain’s begun. GWENDOLINE: You will be missed, play or no play. RAFFLES: I’m glad of that. GWENDOLINE: None should know it so well. But you speak as though you were not coming back. RAFFLES: Perhaps I never shall. GWENDOLINE: Never again? Oh, why? GWENDOLINE: Tell me the real one? RAFFLES: Then -because you might be sorry if I did. GWENDOLINE: If you come back, how could I be? 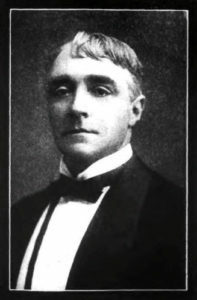 RAFFLES: Miss Conran, I’ve a thousand things to say to you, and only a minute to say them in, but I wish to thank you for something – something you have done for me. GWENDOLINE: Something that I have done? RAFFLES: Yes, Miss Conran, you are the first human being who has made me wish to take my own life differently; of course, it’s too late, but I want to thank you all the same. Mine has been an idle life – and worse – far worse – a rotten, selfish, unsporting innings. GWENDOLINE: I don’t believe a word you say. RAFFLES: It’s the truth, though not the whole truth, heaven knows. Yet one might make a decent shot or two before the wicket falls – one might do somebody a good turn. GWENDOLINE: As if it would be something new. RAFFLES: You don’t know me a bit – I’ve far fewer friends than you think – far more enemies. One of these days, Miss Conran, the whole world will be my enemy, but even when that day comes there will still be left one dear, good fellow – the loyalest of men14 – whose loyalty you’ll live to appreciate yourself. To whom I must be loyal too. GWENDOLINE: It may be very wrong of me, but I don’t think I care – much – what my friends have been, as long as they are still -my friends. RAFFLES: Do you mean that? RAFFLES: Will you act up to it? RAFFLES: If there was a man (struggling with emotion) who loved you, who knew – (conquering it) he was unworthy of your love, who was only loyal to you and to his friends, could you for the sake of that loyal love forgive him all the rest? GWENDOLINE: If I loved him yes. RAFFLES: Suppose you were his only hope of salvation in this world and the next, would you deny him that hope? GWENDOLINE: If I loved him – no. RAFFLES: Could you love him? RAFFLES: The man I mean loves you and has long loved you with all his heart. When he speaks again – if he is worthier of you then- will you listen? GWENDOLINE (nods her head- half audibly): Yes-yes! GWENDOLINE (gives him her hands): I promise you-that. RAFFLES: It’s a man’s salvation that you have promised. (Rises.) I told you that you had made life look different to me, that’s why I’m going. There should be some useful work for me somewhere in the world – I mean to see. GWENDOLINE: And when do you come back? RAFFLES: I’m not coming back. GWENDOLINE (amazed- to him): Not coming back? RAFFLES: No! This is good-bye. Miss Conran, I shall never forget all that you- have done for me – I have stolen the sunshine of your presence till I, too, am another man. RAFFLES (half bitter laugh): A strange trick of Fate that makes me plead for another, isn’t it? GWENDOLINE (dazed, swaying): I – don’t – think I understand. RAFFLES: Dear old Bunny, he’s ten times the man you think him. You’ll make him twenty times the man he is. ETHEL: Gwen, I want you. GWENDOLINE (conquering her emotion): Coming, dear, coming. RAFFLES: Bunny, I’ve played your hand – and lost. BUNNY (sits): Shall I tell you why? RAFFLES (with a grim smile): What! Then, by God, she shall not suspect you long- She shan’t! She shan’t! She shan’t! Act II is called in the American script, “Hound and Hare”. For those who don’t follow cricket, there is a bowler at either end of the pitch. In the American version, the weather is fine. “Flannels” was the name given to clothes made especially for playing sports like tennis and cricket, so for a time, “semi-flannels” was used to denote the kind of casual clothes appropriate for attending sporting events held in a casual setting (a local game of cricket, say, as opposed to the Enclosure at Lords). “All-of-a-sudden Peggy” was first a book, then a hugely popular play, and finally (in 1920) a hit movie about a free-spirited young Irish girl whose prospective mother-in-law tries marry her off to an entomologist to “save” her son. As the premise suggests, the production featured a lot of frenetic action, which is what I suspect is implied in calling this an “All of a sudden Peggy” scene. Earlier Lady Melrose is their Aunt Fanny. In the American script she had slept with it around her neck. In the American version, Bedford takes Crawshay to London himself, and allows him to escape along the way, in hope that Crawshay will lead him to confederates. In Britain, when your driving licence was suspended or revoked, the court used to put a mark on the back of it, an “endorsement”. If you were stopped for a traffic violation you had to produce your licence, of course; and if it was “endorsed” on the back, you were arrested. A simple system, but one that worked. Until 1756, “the black hole” was simply the British army name for a military prison. After June 21st of that year, however, the term came to be used exclusively to mean the prison of Fort William, in Calcutta. The fort was besieged by the forces of the Nawab of Bengal, who saw it as a threat to Bengali independence, and it fell on June 20th. According to one account (there are variants), 146 captured British, Dutch and Portuguese soldiers were confined in a space only 14 by 18 feet (4.3 m × 5.5 m), and the overcrowding resulted in the deaths overnight of 123 of the prisoners. Nearly every element of the story is open to dispute except the size of the cell (which may be measured), but the story caused outrage in Britain when it came out. Robert Clive was sent in October to retaliate, and he defeated and overthrew the Nawab at the Battle of Plassey. For an interesting article on whether or not the astronomical term “black hole” for a gravitational singularity derives from the Black Hole of Calcutta, see this. American version: Raffles apparently really will give the money to charity. There is no hint that he wants it for Bunny. Presumably he’ll pay Bunny’s debt from the “private income” the play indicates that he has. A “handbag”, in this case, is not a purse, but a small suitcase. Her purse is in it, as revealed below.